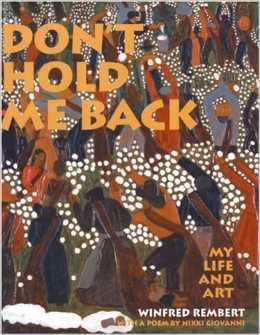 I'm not sure what led me to take my copy of Don't Hold Me Back by Winfred Rembert off my shelf yesterday to show to a family member. I met Rembert back in 2004 when we were both nominated for the Connecticut Book Award, back when there still was a Connecticut Book Award. (Not to be confused with the Nutmeg Award, folks.) But as a result, I looked up Rembert today. Winfred Rembert is a leather folk artist whose work has gotten around. He's had gallery shows that were reviewed in the New York Times. He's had other gallery shows. Oh, look. Another, very recent show. The Huffington Post carried a piece about him. A book has been written about him. And a documentary has been made. I was going to offer my copy of Don't Hold Me Back to a couple of my family members who are library/reading teacher people. But I love folk art! And Rembert signed it! I think I will make them drag it from my cold, stiff hands. They can look forward to fighting for it. Here's something I've been thinking about this afternoon. I love a lot of the folk art I've run into over the years. It's not so much the execution, which I'm not qualified to judge, though there are definitely some things I've liked more than others. It's that these people, who have little to no art training, need to create so badly that they won't let the fact that they have only a vague idea what they're doing stop them. So why don't I feel the same way about work from untrained writers? And was I the equivalent of a folk writer when I started publishing? Why thank you. I'll go take care of that.